Lisa A.Boehm, 49, of Galloway was arrested by Ofc. Scott Winneberger for possession of less than 50 grams of marijuana, possession of CDS paraphernalia, maintaining a nuisance and offering alcohol to underage persons on June 9. Noelle Prusarczyk, 28, of Kunkletown Pa. was arrested by Ofc. Kerry Baerman for theft on June 6. Nancy Means, 51 of Hamilton Twp was arrested by Ofc. Bill Kline for driving while suspended for previous DWI’s on June10. 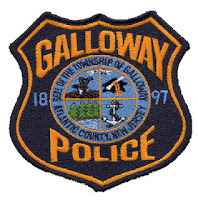 Joseph C Long, 47, of Galloway was arrested by Det. Bryan Casey for theft on June 12. John W. Morgan, 47, of Mullica Hill was arrested by Ofc. Carolyn Buckley for DWI on June 16. Lusvin D. Schubring, 22, of Pleasantville was arrested by Ofc. Scott Winneberger for possession of less than 50 grams of marijuana on June 16.